When I read the first draft of Jenny Schwartz’s GOD’S EAR, I felt the excitement that happens when you know you are encountering a major new playwright. The story of a young couple whose marriage begins to unravel after the death of their young son, the play was constructed in part from the juxtaposition and repetition of cliché and idiom. Jenny was using this most prescribed language to tell a story of remarkable emotional depth, and in this way GOD’S EAR struck me as a play that could only be written now, from and for our times. From her gorgeous adaptation of the Electra story, DISTINGUISHED BEAUTY ELECTRA, to her hysterical and original CAUSE FOR ALARM, which was lauded by critics when it premiered in the NY Fringe Festival, Jenny is fast distinguishing herself as one of the most original and exciting playwrights of her generation. The Vineyard invited Jenny to develop GOD’S EAR in an ongoing process that spanned two seasons. 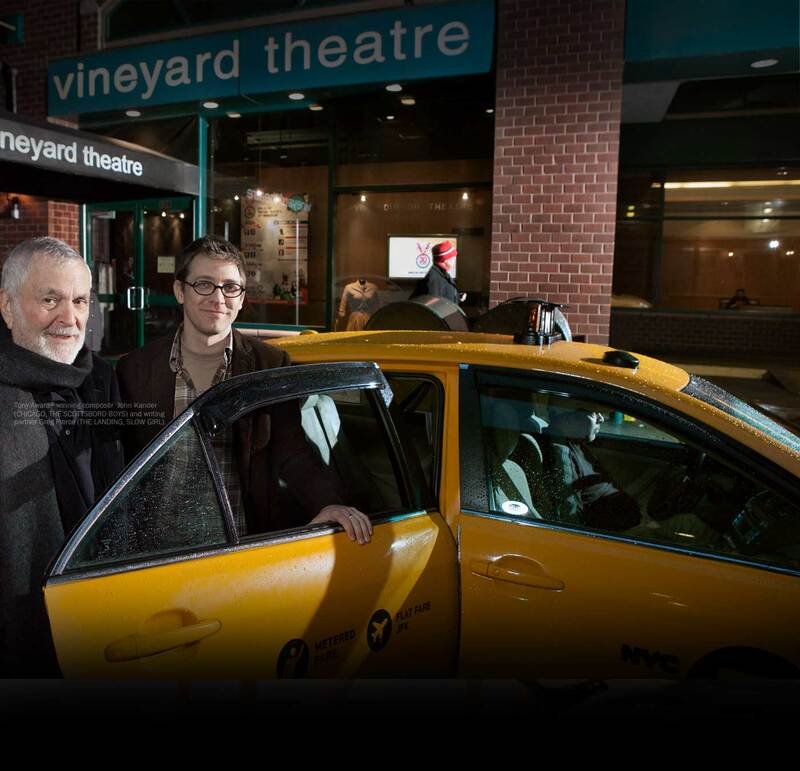 GOD’S EAR was then produced by the acclaimed downtown theatre company New Georges last April, and now comes full circle to The Vineyard stage in an enhanced production in association with New Georges. The Village Voice called Jenny, “A playwright to reckon with,” and Time Out NY called GOD’S EAR, “Tremendous… a rare piece of total theatre.” We agree, and we can’t wait to share GOD’S EAR with you. Jenny took time from a playwriting retreat with Sundance at the Ucross Foundation, to email with me about her longtime obsession with language, her unique writing practices, and how her training as a director informs her writing. The text of GOD’S EAR draws at times upon a vocabulary of clichés. Can you talk about what interests you in contemporary language? The characters in GOD’S EAR, particularly Mel, are constantly bumping up against the limits of language to express the emotional places where they live. Can you talk about the relationship between language and emotion in your plays? With GOD’S EAR, I wanted to deal with the subjects of grief and estrangement in a way that felt honest and emotionally connected; the barrage of language that makes up the play is fueled by and grounded in the characters’ emotions and intentions. Mel experiences a great deal of fury as she expresses her feelings and experiences through language and finds herself with no other vehicle than cliché. Although the play’s plot and language – as well as some of its characters – are absurd and not realistic, the actors have absolutely approached their characters and the text in ways that are real and connected, while attending to the text’s strict rhythm and musicality. So I guess I work inside-out and outside-in at the same time. I started writing GOD’S EAR from an organic, emotional place. Then, I worked the language to try to create a structure to support the emotions, and a palate of words with which to work. Your writing process involves typing the play from the beginning each time you sit down to work on it. How does this practice help you? I think my process of typing the play from the beginning over and over again helps me to figure out a formal structure that supports the emotional landscape. When I get too formal, I usually feel like I’m taking a wrong turn. It also helps me to get the language into my body, and to make writing more of a physical act – it takes a lot of energy to get it down on the page. I think my plays do have their own logic, so retyping helps me follow the logic and see what I am making. You rely on rehearsals with actors to help you move forward when you are writing a play. How does working with actors help your process? I definitely depend on the rehearsal process to help me understand the play. I need to see and hear the text in time and space to be able to figure out what I’m writing, and then I can finish the play. Working with Anne and the actors has helped me enormously. Together we figured out what the play was about, and I shaped the text as a result of that work. In addition to having gone through the playwriting program at Juilliard, you have an MFA in directing from Columbia and were a director before you were a playwright. Do you think your training as a director informs your work as a playwright? Yes. I have tremendous respect for and interest in the craft of directing. I don’t want a director to stage my vision of the play; rather I invite them to invent and create a world that I never could have imagined. Anne Kauffman is an innovative and visionary director, and with the help of her fantastic design team, she’s taken the play and made it her own. I purposefully include very few stage directions or descriptions of design elements in the script. While I am incredibly exacting and precise with regard to the sounds of the words, I leave the play’s physical world entirely up to the director and designers. So, ironically, because I was trained as a director, I am extremely hands-off. I enjoy my role as the playwright and want the director to bring as much of herself to the production as I have. Are there writers whose work you especially admire or have drawn influence from? Harold Pinter and Caryl Churchill are two of my favorites. You were an intern in The Vineyard’s literary office many years ago. How does it feel to be back with a mainstage production? It feels amazing and thrilling! When I was an intern, I was a directing student and only just beginning to find my voice as a writer. With GOD’S EAR, The Vineyard’s support of my process was invaluable – it is what helped me to find and believe in my way of working. The Vineyard gave me time and space to work on this play from when it was twenty pages long, and readings and workshops whenever I needed them. You believed in me and this play and saw it through – it was unconditional support. How would you describe GOD’S EAR? I really can’t describe it. I mean, I CAN, but I’d be grasping at straws. Do you want me to grasp at straws?